When Apple launches its next-generation iPhone, the handset will likely carry a fingerprint sensor embedded into a slightly convex home button made out of sapphire, a major change to current designs. By using a convex home button instead of the familiar concave design, Apple will be able to make room for the much rumored fingerprint sensor without losing precious internal space, according to well-informed KGI analyst Ming-Chi Kuo. 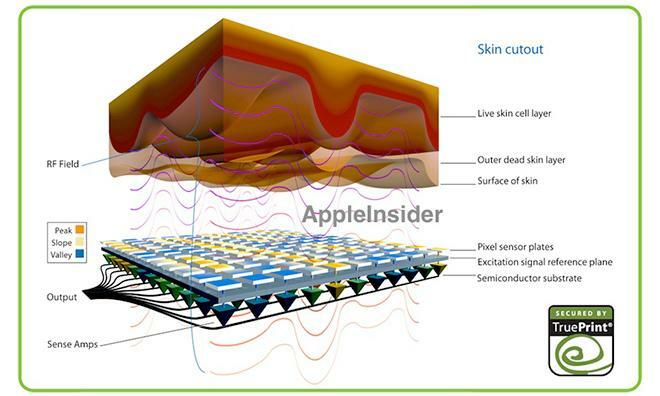 In a research note obtained by AppleInsider, Kuo says Apple is using sapphire because of its resilience to scratches, which will thus protect the fingerprint sensor embedded within. AuthenTec, the biometric security firm Apple purchased in 2012, uses leading-edge capacitive and RF technologies in its biometric chips, a method that images fingerprints differently than existing optics-based systems. Kuo believes the tech is superior as the sensor is not subject to misreadings due to the build up of detritus or dust. Further, the analyst sees Apple's current one-button iPhone design as being an optimal fit for a fingerprint reader. With a single home button, consumers are less likely to be confused as to where to place their finger for scanning. While a convex home button design grants added space for a sensor, the part will become more susceptible to scratches than the concave component Apple has used since the first iPhone debuted in 2007. To protect the sensitive sensor, sapphire glass, a material with a hardness rating second only to diamond, will be used instead of the current plastic composite. The convex design lends itself nicely to a patent Apple filed for in June describing a method of encapsulating a fingerprint sensor package within a confined space. Kuo predicts the sensor's inclusion will keep the iPhone well ahead of competing Android and Windows Phone handsets, possible presaging Apple's entry into secure mobile payments. The system could also yield a safer way to access Apple's cloud computing services like iCloud and iTunes. Earlier on Saturday, a report from AllThingsD cited inside sources as saying the Cupertino, Calif., company will unveil the next-generation iPhone at a Sept. 10 media event.